Cold calling is tough but there are some very clear things you can do when writing your cold call script to improve your results. Our natural instinct as a sales person is to ask the prospect how they are doing at the very beginning of a call in an attempt to build rapport. Your prospect is extremely busy and if you are cold calling, they do not know you at this point. As a result, if you put them in a place where they need to spend their valuable time telling a stranger how they are doing, you are starting to waste their time. And this breaks rapport, which is the exact opposite of your intention. Your prospect is likely always busy to some degree. You want to make sure they are not “crazy” busy with some sort of fire going as that is not a good time for you to try to grab 2 to 5 minutes from them. To get a feeling for where the prospect stands in terms of attention, ask them “Have I caught you in the middle of anything?” in your cold call script. This will also build rapport as it is extremely respectful and can even decrease their guardedness. Your prospect will answer the phone with their guard at a medium level. Everything that you will say and do will make this guardedness go up or down. When you sound like a sales person, the guardedness increases and the prospect will try to get rid of you. To counter this, do everything you can to not sound like a person and do this by minimizing product and company discussion in the early part of your cold call script. We are all a little self-absorbed. You are. I am. Your prospect only really cares about their stuff and what is in it for them. Take this into consideration when writing your cold calling script. 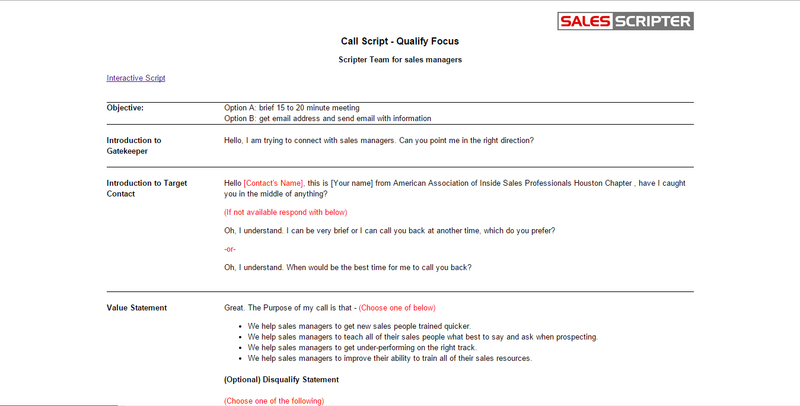 In order to get the call focused on the prospect, simply include questions in your cold call script. This will not only make them more engaged, it will also help you to extract valuable information. A good way to design your questions in your cold calling script is to have them pre-qualify the prospect. These are questions that find out what is going on on the prospect’s side and also identifies who they are and how they fit into the organization and the buying process. Good pre-qualifying questions will uncover pain that the prospect is experiencing. But the prospect might not give you the answer you are looking for so it can be extremely helpful to have a list of common pain points that many of your prospects or customers experience in your cold call script. It can be easy for us to always try to completely sell our products and services every time we speak with a prospect. But the goal of a cold call should focus primarily on selling the next stage in your sales process. In most cases, the next step after a 2 to 5 minute cold call is not a sale as there usually needs to be a larger conversation, meeting, or appointment before heading toward a purchase. Avoid trying to sell the product and shift toward simply trying to get the meeting, or whatever the next step in your process is. You need to build some amount of interest on the prospect’s side in your cold call script but you only need to build enough to close for commitment to go to the next stage of your sales process. In order to do this, don’t get into details about the features and functionality of your product. Instead, focus on the value that your product delivers. Discuss the ROI that your product delivers. Share how you differ from other options out there. Paint a picture for what could happen if the prospect does not make a change. 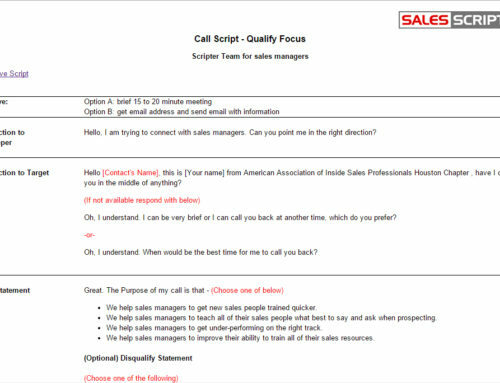 SalesScripter helps sales pros and sales managers to write a cold call script.